Counting down to Christmas could become a bit less than enchanting when surrounded 365 days a year by tinsel and trees, ornaments and garland, angels and carolers. However, Bonnie and Karl Kriscovich find it unimaginable that Christmas could be anything but magical, celebrating the joy and twinkle of Christmas every day of the year, welcoming visitors to Christmas on the Harbour, the fourth island incarnation of their retail destination, located in the shops at Shelter Cove Harbour & Marina. Bonnie Kriscovich credits keeping Christmas fresh and beautiful year-round in all their shops to her collaboration with designer Anthony Mastropole, who works out of their two Savannah locations. “Anthony has been with me for 25 years. From the beginning we did designs for hotels, and we designed people’s homes. Now he travels with me to each of the stores to keep everything looking beautiful. We work very well together,” she said. 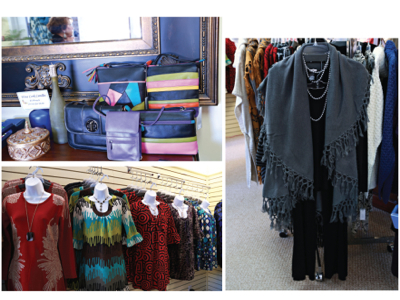 With their creative retail minds always going, Bonnie and Karl Kriscovich expanded their business in the summer of 2014, opening Seasons, a women’s clothing boutique, also located in the lovely shopping district overlooking Shelter Cove Marina. “There’s something in the store for everybody,” Bonnie said. The Clara Sunwoo line of soft-to-the-touch, stretch, knitwear, is a splendid line of breathable, lightweight, pack-and-wear women’s clothing. “Every lady can wear it,” Bonnie said. “It’s so packable, you can roll it up, put it in your suitcase, and when you arrive your clothes look beautiful. I took Clara Sunwoo pants and tops on a cruise, and they were perfect. I could feel casual or very dressed up.” Seasons also carries this year’s popular leggings—the just-right pairing to the Clara Sunwoo collection. Wraps are a necessity this fall, and Seasons is well-stocked with lines from six different companies. “We have ponchos and wraps, with fringe, without fringe. If you want a wrap, we have it,” Bonnie said. Also, their Ili line of leather goods is affordable and luxurious—a lovely and practical surprise. “Ili’s leather is soft and supple,” Bonnie said. With bags, purses, and accessories, there are yummy options whether gifting yourself or someone else, all for around $100 or less. 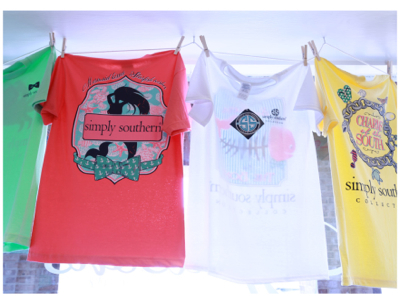 For a whimsical fashion touch, Seasons also carries the fabulous Simply Southern line of tees that have taken the South like a storm with a southern drawl. Seasons is filled with fun, flirty and practical pieces for ladies. With backgrounds in sales, the Kriscovichs have found enduring retail success because of their willingness to learn, and by surrounding themselves with talented people. “We wanted to be in business for ourselves,” Bonnie said. “That’s how we started, and we learned to love it.” With Karl spending much of his time out in the stores, and Bonnie running more of the behind-the-scenes operation, they complement each other’s strengths. “The biggest learning curve is buying for everybody’s tastes. We buy well together,” Bonnie said. Christmas on the Harbour is managed by Beckey Norris; Heather Miles, manages Seasons, providing a solid foundation for these retailer’s local success. Assistant April Hinton keeps everyone on-track, going on buying trips and providing valuable input. “April keeps me in line. She’s been with me a long time and helps keep the focus in the right place, whether we’re buying for Christmas or for Seasons. I want to buy 26 dozen of everything, because I’m used to buying for the Christmas stores. That doesn’t always work,” Bonnie joked. 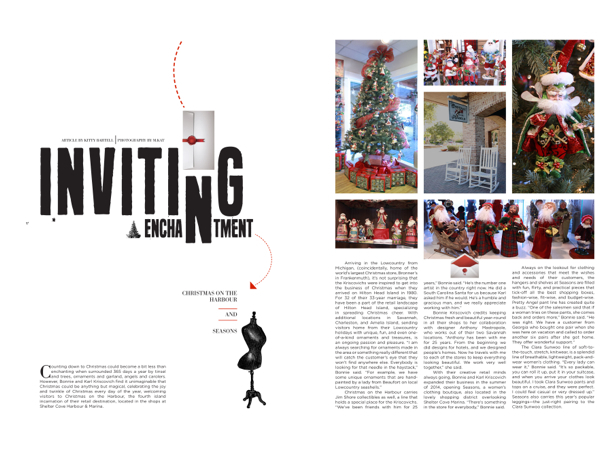 The Christmas spirit never dims for the Kriscovichs, who are planning their annual Christmas Eve party at their home. “Some years there are 15 or 20 guests,” Bonnie said. “Sometimes it swells to 50.” With their Christmas tree traditionally trimmed in gold and white with poinsettias and magnolias, it provides a stunning backdrop to the festivities. “Every year, people take family pictures in front of our tree. I really love that,” Bonnie said. This year Bonnie and Karl are looking forward to a big family Christmas with many of their seven children and fourteen grandchildren planning to visit. Like treasures and treats tucked into Santa’s sack, strolling into Shelter Cove Harbour & Marina reveals two special shops, carefully crafted and curated to delight. Christmas on the Harbour and Seasons are decidedly, and equally enchanting. For more information, call Christmas on the Harbour at (843) 785-6748 or Seasons at (843) 842-9911. Both are located at Shelter Cove Harbour & Marina.